Use external services to Copy Files from and to a server automatically (no manual up- and downloading is necessary), to publish your result files to Podcasting/Audio/Video Hosting Services and to connect to external Speech Recognition Engines. With Auphonic you can export all your processed audio or video files to YouTube. If your production is audio-only, we automatically generate a video track from your Cover Image (and Chapter Images)! If you want to add an Audiogram (audio waveform visualization) to your YouTube video, please add an Audiogram Output File to your production - see also Auphonic Audiogram Generator: Waveform Videos for Podcasts and Audio Files. For more information about our YouTube export read the blog post YouTube Export. Libsyn (Liberated Syndication) is a U.S. podcast hosting company which supports automatic RSS feed generation, webpages and more. It offers a monthly subscription model, see features and pricing. Auphonic always exports an MP3 audio format to libsyn, see Auphonic to Libsyn details. The title, summary and cover image can be used in libsyn’s RSS feed. A unique alpha numeric identifier for the show. This must be configured in your libsyn show settings! /quickcast will publish your show immediately, /public needs an additional step and /dropbox requires manual episode creation! For more details see Auphonic to Libsyn details. Must be your full email address, as registered at Libsyn! Facebook is not only a social media giant, the company also provides valuable tools for broadcasting. Use Facebook for live streaming, then import, process and distribute the audio/video with Auphonic. Post your Auphonic audio or video productions directly to the news feed of your Facebook Page or User. Use Facebook as a general media hosting service and share the link or embed the audio/video on any webpage (also visible to non-Facebook users). Auphonic can export/import audio or video files to/from your Facebook pages or user accounts. Metadata fields (Title, Description, Cover Image) and Speech Recognition results will be exported/imported as well. If your production is audio-only, we automatically generate a video track from your Cover Image (and Chapter Images). Add an Audiogram Output File if you want to add an Audiogram (audio waveform visualization) to your Facebook video. Select your Facebook User or any Page connected to your account. It is always possible to remove or edit the connection in your Facebook Settings (Tab Apps). SoundCloud is one of the biggest audio hosting companies and also offers a podcasting program including an RSS feed. Our SoundCloud integration enables the export and import of audio files to and from SoundCloud. Auphonic Chapter Marks become SoundCloud Comments, directly visible in the timeline of the SoundCloud player! For more information see our blog post SoundCloud Integration. Podigee offers a complete podcasting hosting and publish solution including its own CDN, support for additional metadata like shownotes, chaptermarks and keywords, RSS feeds, a customized website, realtime statistics, the Podlove Subscribe Button, an advanced web player and more. If you upload an audio file to Podigee, it will be processed by Auphonic automatically (unless you deactivate it). You don’t need an Auphonic account at all, everything is done directly by Podigee. The Podlove Podcast Publisher is an open source Wordpress plugin. It offers powerful analytics, the Podlove Subscribe Button, custom templating, automatic checks that everything runs smoothly and much more. The Podlove Publisher is free but must be installed on your own server. You can use the Podlove Publisher to import Auphonic productions and publish them as a new podcast. It’s also possible to create new productions including all metadata directly from the Podlove Publisher, so that you don’t have to use the auphonic.com web page at all. Spreaker is a podcast hosting company which offers audio file hosting with web page, RSS feed generation for multiple shows, chapter marks, advanced audio analytics, embeddable audio player widget, live streaming and more. We automatically encodes an optimal output file format for Spreaker (MP3, 128kbps) and all metadata tags entered in our interface, including Chapter Marks, are also available in the file hosted at the Spreaker servers. For more information see our blog post Connecting Spreaker and Auphonic. generates an RSS feed and a web page for your episodes. For more information see our Blubrry blog post. Must be your full email address, as registered at Blubrry! Zencastr is a web application that allows podcasters to record remote (skype/hangouts) guests in perfect quality. Zencastr creates a VOIP connection between you and your guests directly in your browser and records each party locally from their own computer to a high quality audio file. No more dropouts due to a bad connection. No more changes in quality during the show. Nothing but crystal clear audio. Zencastr uses the Auphonic multitrack algorithms for automatic post production of your recorded audio tracks. Auphonic processes all tracks individually as well as combined and creates the final mixdown automatically. You don’t need an Auphonic account at all, everything is done directly by Zencastr. Connect to any FTP server to import/export files to/from Auphonic. Enter any name you prefer to remember this account when creating a production/preset. Hostname of the server (without protocol), e.g. auphonic.com, my-server.jp, etc. The default FTP port is 21. Exact path on your server, where files should be copied. Your FTP server username. Leave empty for anonymous login! Your FTP server password. Leave empty for anonymous login! Base URL on your web server, where files will be downloadable. Used to construct full URLs of all your results files! Connect to any SFTP server to import/export audio and video files to/from Auphonic. 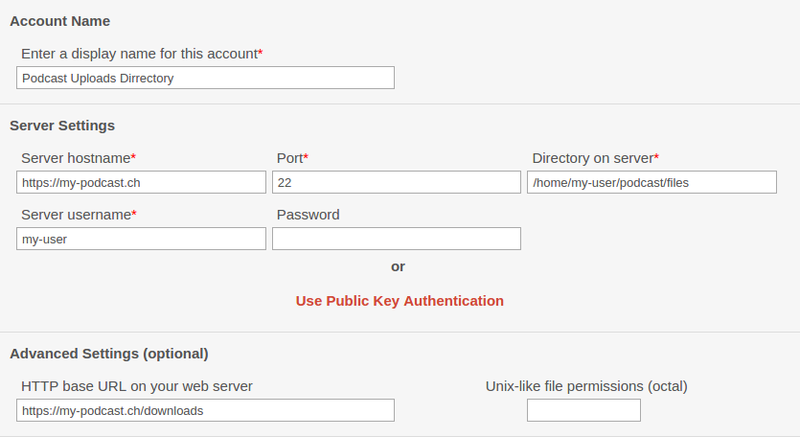 If you don’t want to use a password, we automatically generate a public key for SFTP transfers (optional). Copy the public key to your SFTP server and add it to the file ~/.ssh/authorized_keys. For more information about public key authentication see Getting started with SSH. The default SFTP port is 22. No password is required for Public Key Authentication! Unix style permissions for output files in octal notation, see Unix Permissions Calculator! Leave empty for default values of your server. Connect to a Dropbox account to import/export audio and video files to/from Auphonic. Input files must be in the directory /Apps/auphonic/ of your Dropbox, result files will be written to /Apps/auphonic/auphonic-results. NOTE: Auphonic has access rights only inside the directory /Apps/auphonic and cannot see all other files of your Dropbox! Similar to our Dropbox integration, you can use Google Drive to import/export audio and video files to/from Auphonic. Input files must be in the directory auphonic of your Google Drive, result files will be written to auphonic/auphonic-results. For more information see our blog post Google Drive Integration in Auphonic. If you want to use Google Cloud Storage, please use Generic S3 and Google Cloud Storage. Amazon S3 is the famous cloud storage by Amazon. You can use any existing Amazon S3 Bucket to import/export audio and video files to/from Auphonic. For more information see our Amazon S3 blog post. NOTE: If you need a generic (non-Amazon) S3 storage, please use our Generic S3 Storage Service instead! S3 buckets must be already created, e.g. with the S3 Management Console. Find and create your Access Key at AWS credentials page. Get your Secret Access Key at AWS credentials page. Prefix for all files which are exported from Auphonic to S3. Use e.g. my-prefix/ to simulate folders. Permissions for files exported from Auphonic to S3, see Canned ACL Overview for details. to import/export audio and video files to/from Auphonic. For more information see Google Cloud Storage or Generic S3 Storage setup. NOTE: If you want Amazon S3, please use our Amazon S3 Service instead! Endpoint of the S3 service API, e.g. for Google it’s storage.googleapis.com. For detailed information, please see S3 storage blog post. S3 buckets must be already created, for Google use the Cloud Storage Browser. For Google, get/create your Access Key in tab Interoperability here. For Google, get/create your Secret in tab Interoperability here. Transfer your result files to the Internet Archive (archive.org) for free audio/video file hosting. Archive.org automatically creates an HTML page from the metadata of your Auphonic production, including all output file formats. For more details see our Archive.org blog post. Please create an Archive.org Account and API key first! Create your Access Key at the Archive.org API page. Get your Secret Key at the Archive.org API page. Connect to any WebDAV server to import/export files to/from Auphonic. For detailed information see our WebDAV blog post. Google Cloud Speech API is the speech to text engine developed by Google and supports over 80 languages. 60 minutes of audio per month are free, for more see Pricing. For more details please see Speech Recognition Services in Auphonic. 1. Optional: Sign up for an account at cloud.google.com/freetrial (credit card required). 2. Create a new project in the Cloud Console. 3. Enable the Cloud Speech API, select your project, continue and click on the Go to credentials button. 4. Answer “Are you using Google App Engine or Google Compute Engine?” with Yes. 5. Click on “What credentials do I need?” below, then on Done. 6. Continue and click on Create credentials / API key. 7. Copy your API key and paste it in the form below (might take a minute). Copy the API Key from your Google Cloud Console: in API Manager (top left), section Credentials. Wit.ai provides an online natural language processing platform, which also includes speech recognition. Wit is free, including for commercial use. See FAQ and Terms. 1. Sign up for an account at wit.ai. 2. Create a New App and select the correct language (App can be private). 3. In your new wit.ai App, go to Settings (top right). 4. Copy the Server Access Token (in API Details) and paste it in the form below. IMPORTANT: You have to create a new Wit App for every language you use! Copy the Server Access Token from your Wit.ai App: in Settings (top right), section API Details. Amazon Transcribe offers accurate transcriptions in multiple languages at low costs (see Pricing), including keywords, word confidence, timestamps and punctuation. 1. Sign up for an Amazon Web Service (AWS) Account. 2. Create your Access Key ID and Secret Access Key at the AWS credentials page. 3. Copy the both keys and paste them into the form below. Find and create your Access Key at the AWS credentials page. Get your Secret Access Key at the AWS credentials page. Speechmatics offers accurate transcriptions in many languages including word confidence values, timestamps and punctuation. 1. Sign up for a Speechmatics Account. 2. Copy your User ID and API Auth Token Key at the Account page and paste them into the form below. Get your User ID (just a number) from the Speechmatics account page. Get your API Auth Token from the Speechmatics account page.